Choose your beach well. Steep beaches like those at Big Lagoon, Dry Lagoon, Stone Lagoon, and Freshwater Lagoon are particularly dangerous because the force of the ocean waves can reach much farther up the beach and pull you into the surf. Steep beaches also have coarser sand that washes out from under your feet making it harder to resist being pulled into the water. For these reasons, avoid steep beaches, especially if you have children or dogs. Flatter beaches like those at Clam Beach and Moonstone Beach are much better choices. Check the forecast for high surf advisory before going to the beach. Stay back from the water, and never turn your back on the ocean. Don’t be fooled by waves that look small. They can be small for up to twenty minutes before a big set of waves surprises you. The best approach is to stay further back from the water than you might think is necessary – definitely way above the wet sand line - and never turn your back on the ocean. For many activities, like walking on the beach, this is the best protection. 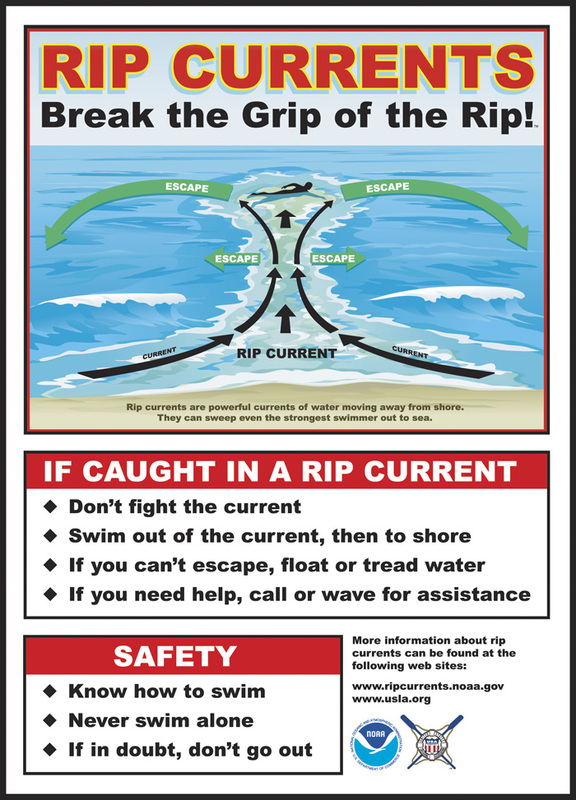 But, if you have to be close to the water, and especially if you’re going to be distracted, for example for surf fishing or agate hunting, wear a life vest if you do not know how to swim. Don’t go in after dogs. Dogs that are pulled into the surf almost always get out on their own…so stay on dry land and wait for them to get out. Of course, it’s better to keep them out of the water in the first place. Keeping them on a leash works, but if they are off leash then stay very far from the water and don’t throw sticks or balls in the water for them. If you must have your dog in the ocean, put a dog life vest on them. They really do work and your dog can still run and play. Don’t go in after a person. If a person is pulled into the water, don’t go in the water after them. Remember that you will likely also get in trouble so that when rescuers arrive they will have to divide their time among multiple victims. It is much better to call 911 and be prepared to guide rescuers to the person in trouble. Check the river before going in. Sudden drop offs and swift currents often get people in trouble who are just wading knee-deep in the river. The very next step can put you in water that is deeper and faster than you are ready for. So check the river for swift currents and steep drop offs before going in – don’t be fooled by a calm appearance on the surface. Sometimes getting a higher vantage point can help you see the true nature of the river. Wearing a life vest never hurts, even for wading. This is especially true for non-swimmers. Of course, children should always wear life vests – even if they are just playing near the shore. They can quickly enter the water and get in trouble when your attention is diverted for only a moment. Remember new hazards are present each spring; a stretch of river that was safe in the fall may be dangerous in the following spring. Spring flows are particularly cold and dangerous. Don't go in the water after someone in trouble. Rescue from shore and get help. AGAIN, DON’T GO IN AFTER DOGS AS THEY ALMOST ALWAYS GET OUT ON THEIR OWN. SHARE THIS MESSAGE WITH YOUR FAMILY , ESPECIALLY CHILDREN. SHARE IT WITH FRIENDS AND CO-WORKERS. EVEN ENGAGE PERFECT STRANGERS IF YOU SEE THEM DOING SOMETHING DANGEROUS. MAKE BEACH AND RIVER SAFETY AWARENESS PART OF WHO WE ARE ON THE NORTH COAST.